In the middle of a D&D Campaign and one of the players was inspired by watching the Tom and His Friends video. 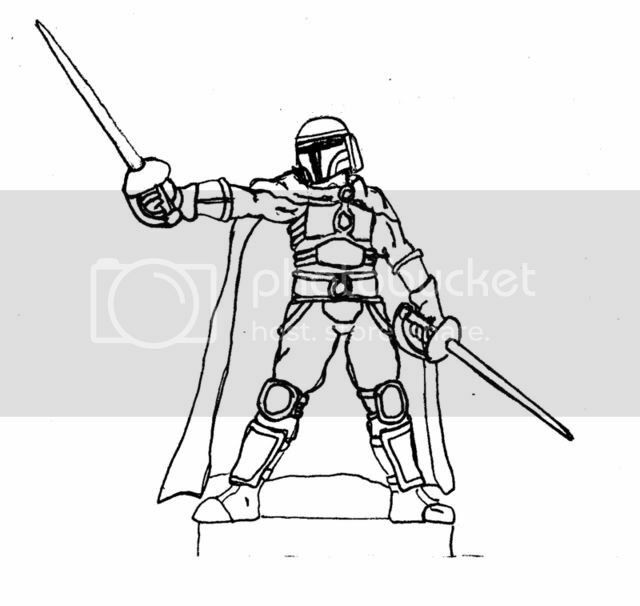 TLDR: We have a thief who's named Bobba Fett in our adventuring party. Are you offering him up on the coloring pages? He looks a little like a super hero to me (hint, hint)! After I finish the back art and get him in miniature form, sure thing. Finally remembered to scan and edit this guy. I thought I would get a chance to color this guy yesterday... but didn't, sorry! 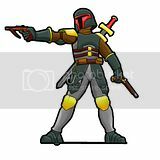 Are you looking for him to be JUST like Boba Fett, or a different color scheme? If you could keep the Bobba Fett Color scheme, that would be fantastic. I emailed you my version of him today. If you don't want to post it, I understand. It was the closest I could come up with. The marker gives the clothing and cape a realistic texture and your shadowing and highlight give it great depth. I tinkered with it some. Mostly just bringing the line art back to a true black and patching a few white spots. Made a few improvements to line art as I went. I'll try and get a photo of it in action during this weekends D&D session. Thanks again for your contribution !! Sorry about that! I meant to fix that before I sent it. I was out of black ink, and bought one of those "re-filled" ink cartridges. I should have thought twice when there was a big warning saying "WILL NOT VOID YOUR PRINTER'S WARRANTY." I'm quite happy with it, and since my gaming group is generally impressed with our cardboard warriors I'm sure they will be quite pleased to see Bobba Fett hit the table.